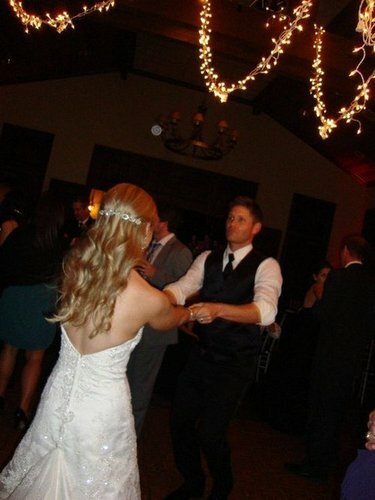 Jensen with his sister at her wedding!. . Wallpaper and background images in the 詹森·阿克斯 club tagged: jensen ackles mckenzie ackles wedding 2010. This 詹森·阿克斯 photo contains 伴娘, 荣誉女仆, and 伴娘伴娘. There might also be 花束, 胸花, 波西, 香奈儿, 捧花, 铭文, 西装礼服, 礼服, 燕尾服, 尾巴, 白色领带, 白色领带和尾巴, 礼服套装, 全套连衣裙, 尾衣, 白领, 白领和尾巴, 穿着西装, 白色的领带, 系白色的领带和尾巴, 袍, and 礼服. wow ambra where did you get this ?? and when did this happen ?